Astronomers are very limited in ability to actually visit and explore their objects of interest. Humans have personally visited only one other body in the cosmos other than Earth: the Moon. We have sent spacecraft to most of the planets in our own solar system and received treasure troves of data and information about those places, including their moons, some asteroids, and comets. But when it comes down to more distant objects—and most of the Universe—we basically have only the light we receive from those objects and our imagination and ingenuity to analyze and interpret that light. Fortunately, we are not restricted to visible light only. We have detectors for all types of electromagnetic radiation: infrared light, ultraviolet light, x-rays, gamma rays, and radio waves. Kyle Cudworth controlling the Yerkes Observatory 40" telescope—the largest refractor telescope in the world. One of the simplest tools of astronomy is something to help find things in the sky: a star map. There are a wide variety of these, ranging from those ideal for beginning stargazers to highly detailed maps and computer programs for advanced amateur or professional astronomers. One kind of star map, the planisphere, is adjustable to show what the sky looks like any time of night and any time of year. Rotate—think of something spinning on its own axis. Revolve—think of something orbiting (going around) something else. These terms are verbs, but similarly, people often confuse the corresponding nouns: rotation and revolution. Rotation—Earth spinning on its axis makes the sky seem to move from east to west. Precession—the wobbling of the Earth’s rotation axis, so the direction that Earth's axis points in the sky slowly drifts over thousands of years— 26,000 years for one complete wobble. Earth’s axis currently points to within a degree of the star Polaris (North Star). In about 10,000 years it will point closer to the very bright star Vega, in the constellation Lyra. In the investigation below, Star Maps, you can construct your own star map and use it not only to find things in the sky, but to show how the sky changes with time. To roughly locate things in the sky, we can identify groups of stars, called constellations. But to specify exactly where an object is in the sky, we use celestial coordinates. Celestial coordinates are to the sky, as geographical coordinates (latitude and longitude are to the Earth. The Earth’s spin determines special locations on Earth. The spin axis goes through the North and South Poles, and midway between them, is the equator. Latitude—To indicate how far north or south we are on Earth, we use degrees (°) of latitude. The equator is neither north nor south and is 0° latitude. Latitude lines range between 90°S, which is the latitude of the South pole, and 90°North, the latitude of the North Pole. Longitude—To indicate how far east or west we are, we use longitude in degrees. Longitude lines are perpendicular to the latitude lines and go from the North Pole to the South Pole. As Earth spins, longitude lines swing under the Sun “like clock-work.” A zero longitude line was arbitrarily chosen to go through Greenwich, England. Longitude lines are numbered to 180 degrees east of Greenwich and 180 degrees west of Greenwich. For telling more precise locations, each degree of latitude or longitude is subdivided into 60 minutes, often called minutes of arc (measure of angle, not time). Each minute is further divided into 60 seconds of arc. An apostrophe (') is the symbol for minutes of arc, and a quote mark (") is the symbol for seconds of arc. Example: San Francisco, California is 122° 26' west of Greenwich and 37°46' north of the equator. These geographical coordinates are abbreviated 37°46' N 122°26' W.
Long ago, people believed that there was a giant sphere to which the stars were attached—the celestial sphere. Imagine extending the Earth’s axis infinitely into space, north and south. It would pierce that sphere in two places: the celestial north pole and the celestial south pole. If Earth’s equator were extended infinitely outward to the celestial sphere, it would become the celestial equator. Even though we know there is no physical sphere out there holding up the stars, we still find it convenient to think of an imaginary celestial sphere to specifying locations of things in the sky. The “celestial latitude lines” are called declination. As with latitude on Earth, declination in the sky increases from 0°at the celestial equator to 90° at the celestial North or South pole. As with latitude on Earth, each degree has 60 minute divisions (') and each minute is further divided into 60 seconds ("). Right Ascension is the name of the celestial coordinate that corresponds to longitude on Earth. Unlike longitude, which is measured in degrees and minutes, right ascension is measured in hours and minutes. There are 24 hours of right ascension corresponding to the full sweep of 360 degrees around the celestial equator. Simple division will tell you that each hour of right ascension must be equivalent to 15 degrees of arc. As you might expect by now, each hour has 60 minute divisions (') and each minute is further divided into 60 seconds ("). Make “Uncle Al's HOU Sky Wheel” to demonstrate the motion of the earth and guide your observation of the stars. Since astronomical objects are so far away, detecting light from those objects is one of the most important ways we have to learn anything at all about them. For the most part, we can’t physically go out there and get samples of material or poke around. 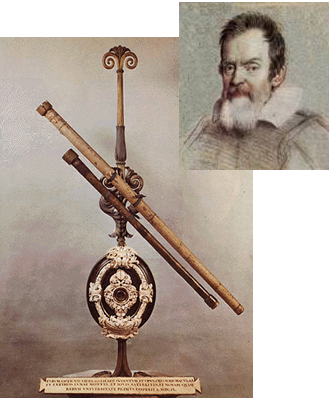 Galileo Galilei, in 1609, was the first person to do serious observations of sky objects with a telescope.Galileo’s telescope was very simple: two lenses, one at each end of a tube. It was one of the first refractor telescopes. The first telescopes were built in the time of Galileo, in 1608, by Jan Lippershey, an eyeglass maker in an area of Europe that is now Holland. Two key functions of a telescope are (1) to gather light from dim objects and (2) to make things look bigger. These are two powers of a telescope: light-gathering power to make dim objects look brighter, and magnifying power to make distant objects look bigger. Generally speaking there are two types of telescopes: one type, called a refractor telescope, depends on a large lens of curved glass to gather light and focus the light towards a smaller lens (or system of lenses) called the eyepiece. Galileo Galilei, in 1609, was the first person to do serious observations of sky objects with a telescope. Galileo’s telescope (pictured above) was very simple: two lenses, one at each end of a tube. It was one of the first refractor telescopes. The other type of telescope, called a reflector, depends on a large curved mirror to gather light and focus it towards the eyepiece. Today there are many types of telescopes, but most of the largest ones are reflectors—they depend on mirrors for light-gathering. 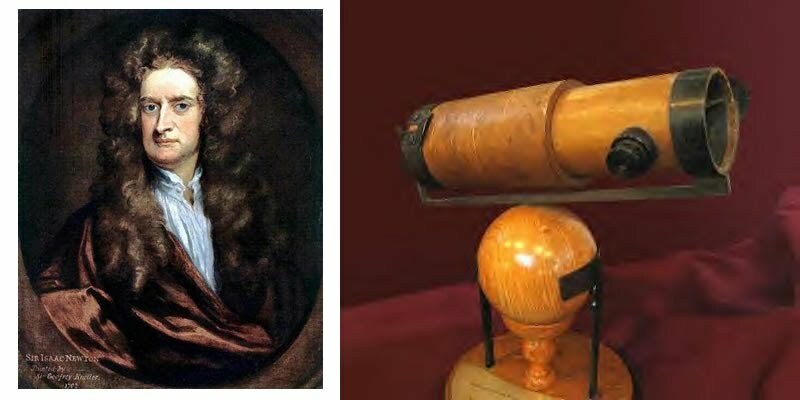 Above is a portrait of Sir Isaac Newton and a photograph of a replica of his reflector telescope. 2005 - First light at SALT, the largest optical telescope in the southern hemisphere, with a primary mirror diameter of 11 meters. For about 400 years, people have been putting their eyes up close to the eyepieces of telescopes and enjoying magnificent views of heavenly objects. In 1727, Johann Heinrich Schulze discovered that silver nitrate darkened upon exposure to light—laying the groundwork for the invention of photography. In 1840, John William Draper started the discipline of astrophotography and made the first photograph of the Moon. Chemical reactions on photographic film are much more sensitive than the human eye, largely because many many photons can be collected from very faint objects in a photographic exposure of many minutes. Astrophotography can capture faint details that the eye cannot detect. Electronic photography was ushered in after the CCD (charge coupled device) was invented in 1969 by Willard Boyle and George E. Smith at AT&T Bell Labs. CCDs have the ability to transfer electric charge along the surface of a semiconductor and can receive charge by converting light energy to electrical energy through the photoelectric effect. In this way electronic images are created. The Keck Observatory has two telescopes, each with a 10 meter diameter primary mirror to collect light. The mirrors are each made of 36 hexagonal segments, each 1.8 meters wide. Courtesy W. M. Keck Observatory. CCD chip being prepared for the NASA Kepler mission photometer. With the advent of digital images of sky objects captured by CCD cameras on telescopes, the opportunity to use computers and image processing software is irresistible and in modern astronomy, indispensable. To study astronomical objects, we really have little more than the light from those objects to reveal their qualities and their essence. The light is made of up tiny packets we call photons, and in a CCD, each photon that strikes the CCD is converted into an electrical pulse that is stored and recorded in computer memory. The CCD is made up of rows and columns of tiny sensors that capture each tiny element of the picture. These picture elements are called pixels. Learn about how the images generated using CCD cameras, such as the ones used with HOU, work. There is a myriad variety of celestial objects. Astronomers delight in describing, classifying, and naming them, but also grapple with trying to explain why they look the way they do. Left to right: the Spitzer Infrared Observatory; the Chandra X-Ray Observatory; and the Greenbank Radio Telescope, West Virginia. Click on the image above for a larger view. Even though we generally only have the light from astronomical objects to learn what we can from them, the amount of information contained in that light can be quite rich. Light energies can be described in terms of numbers of photons which is essentially brightness. But each photon also has an intrinsic energy that we usually describe in the language of waves: wavelength (how long the waves are) and frequency (how fast the waves vibrate). Lower energy photons are longer wavelength and lower frequency. Higher energy photons are shorter wavelength and higher frequency. Colors of visible light range rainbow-like from red colors with long wavelengths (low frequency) to violet colors (short wavelengths). Higher energies than violet go from ultraviolet light to x-rays to gamma rays. Lower energy photons go from infrared light to microwaves to radio waves. Astronomers have worked with engineers to create special telescopes and detectors for sensing these invisible energies. On this page you see some photos of some such telescopes. In the next chapter, we look in a bit more depth about how we can find out a lot about stars just by cleverly analyzing the light from those stars.